Microsoft has released the capability of converting VMs with unmanaged Disks to Managed Disks. 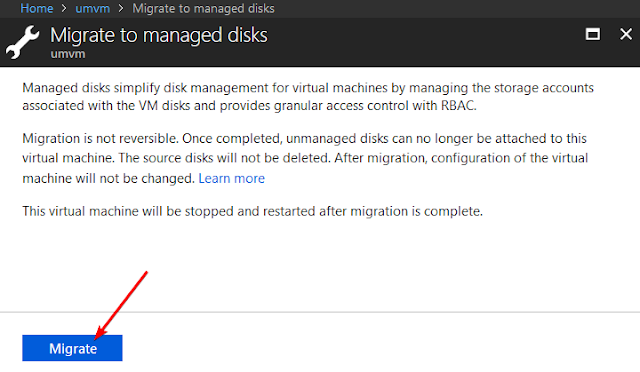 Now the migrations are available to Managed Disks in single click without requiring PowerShell or CLI scripts. What is a Managed Disk? Azure Managed Disks simplifies disk management for Azure IaaS VMs by managing the storage accounts associated with the VM disks. You only have to specify the type (Standard HDD, Standard SSD, or Premium SSD) and the size of disk you need, and Azure creates and manages the disk for you. What you can do with managed Disk. Achieve high-availability across your compute and storage resources with aligned fault domains. Create VM Scale Sets with up to 1,000 instances. Integrate disks, snapshots, images as first-class resources into your architecture. It’s so easy. Just One click. Once you are using a VM without managed disks, you will see an info banner on the VM overview blade. Click there and you will be taken to the migration page. Once migration has finished view the resource groups and check. There will be a new disk created as managed disk. 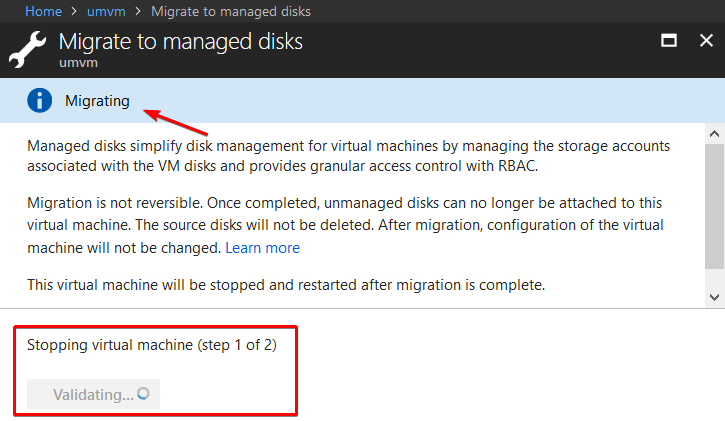 You can also automate the migration to managed disks using PowerShell and CLI scripts.